The first week of January has been cold and costly for many area homeowners who are calling AAA. But cars that won’t start aren’t the only problems. AAA is also hearing from those who have had home flooding due to broken pipes. Many find themselves dealing with damage caused by frozen or burst pipes – and, the thawing from warmer temperatures, along with refreezing at night, that will occur during this week could continue to contribute to the problem. • If you discover that pipes are frozen, don’t wait for them to burst. Take measures to thaw them immediately by warming them with a hair dryer or safe space heater, or call a plumber for assistance. • If your pipes burst, first turn off the water and then mop up spills. You do not want the water to do more damage than it already has. • Call your insurance company claims department as soon as you can. An insurance adjuster does not need to see the spill before you take action. However, the adjuster will want to inspect any damaged items. • Make temporary repairs and take other steps to protect your property from further damage. Remove any carpet or furniture that can be further damaged from seepage. • Make a list of the damaged articles and take photos. • Save the receipts for what you spend—including additional living expenses if you must leave your home until repairs are completed—and submit them to your insurance company for reimbursement. • Standard homeowners policies will cover most of the kinds of damage that result from a freeze. For example, if house pipes freeze and burst or if ice forms in gutters and causes water to back up under roof shingles and seep into the house. You would also be covered if the weight of snow or ice damages your house. • If your home sustains water damage, it is important to make sure that it is properly dried and repaired to prevent any potential problem with mold. Remember, mold cannot survive without moisture. • Check with your agent or insurance company so you will be sure what your policy covers. According to the Insurance Information Institute, only half of homeowners have an inventory of the possessions they'd want their insurance company to replace in case of a flood, fire, theft or other disaster. January, right after acquiring new items as holiday gifts and, perhaps, cleaning out the old, is the perfect time to create or update a home inventory. It’s certainly better than after a crisis that presents its own challenges. 1. Grab your camera, smartphone, or pen and paper and take a tour of your home. 2. Record everything you'd want your insurance company to replace. Don't forget items that may be hidden away in your closets and garage. 3. Pull together copies of sales receipts and any other documentation. Also note model and serial numbers if you have them. 4. Store your home inventory and related documents in a safe and easily accessible place, including online, with friends or family, or in a safe deposit box. Don't rely solely on your home computer, which should always be backed up, in case of fire or a hard drive crash. 5. 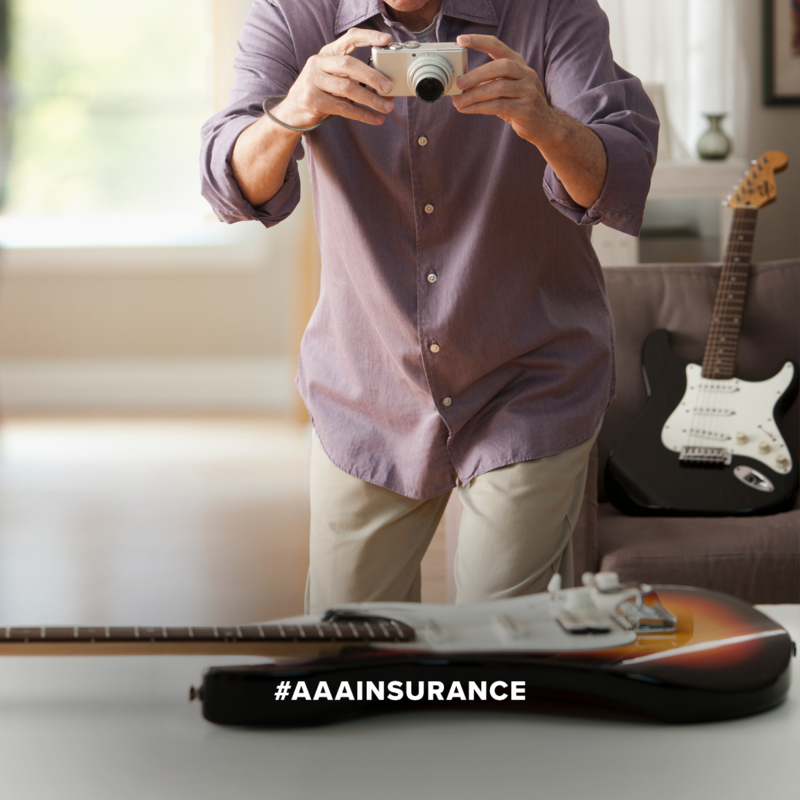 Add up the replacement costs for all of those items to make sure you have enough insurance. Not all policies cover the actual replacement costs, so be sure to check with your insurance agent to make sure you have the coverage you need. In some cases, an additional endorsement may be needed for valuables such as jewelry, cameras, furs, firearms, trading cards, comic books or other items. The availability of endorsements varies from state to state; check with your insurance agent to find out what is offered in your area. • AAA Insurance customers who have suffered damage to their homes or autos can begin filing claims immediately. Claims representatives are ready to assist 24 hours a day. The number is (800)-207-3618. • If not insured through AAA Insurance contact your insurance provider. To find out more about homeowner’s or renter’s insurance, contact your local AAA Oklahoma insurance agent, call800-786-8322 or visit www.aaa.com/insurance. AAA provides automotive, travel, and insurance services to 58million members nationwide and more than 400,000 members in Oklahoma.AAA advocates for the safety and mobility of its members and has been committed to outstanding road service for more than 100 years. AAA is a not-for-profit, fully tax-paying member organization works on behalf of motorists, who can now map a route, find local gas prices, discover discounts, book a hotel, and track their roadside assistance service with the AAA Mobile app (AAA.com/mobile) for iPhone, iPad and Android.For more information, visitwww.AAA.com.